Pelage: Coarse, black and white hairs. Body mostly black with a mantle of white hair extending from the crown of the head to the base of the tail. Range: Broadly distributed across much of Africa; also living on the Arabian Peninsula and the Indian sub-continent. Believed to be absent from the central Sahara Desert and the Mediterranean coast in North Africa. Habitat: A habitat generalist; ratel live in diverse environments, from arid desert outskirts to rainforests. Population in Wild: Global population unknown. Localized population declines in some regions. Locomotion: Walk, trot, tumble, roll, and somersault on the ground. Capable of climbing trees and swimming. Activity Cycle: Predominantly nocturnal, though often active in daylight. Sleep below ground in dens or above-ground in hollows. Highly active when awake; may travel 10-27 km/day (6-17 mi/day) in search of food. Social Groups: Generally non-social, though some interactions between individuals do occur. Males are generally more social than females. Diet: Carnivores; secure most food through active hunting though individuals may scavenge. Small mammals and reptiles make up much of the diet. Predators: Few natural predators; leopard, lion, and spotted hyena are known to take ratels. Conservation initiatives include efforts to make available inexpensive, Ratel-proof hives. © 2015-2018 San Diego Zoo Global. Updated April 2015. Evolutionary history updated Aug 2018. 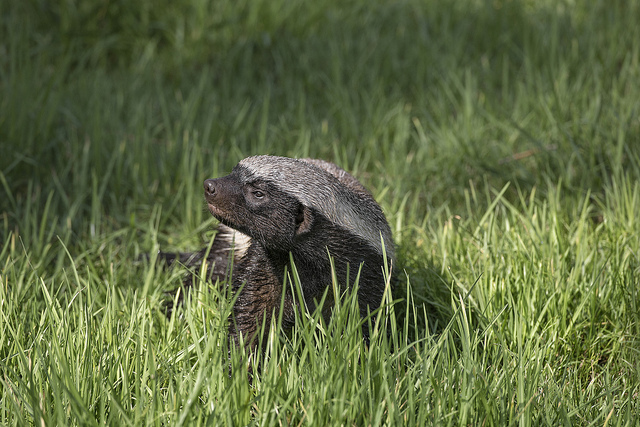 How to cite: Ratel/Honey Badger (Mellivora capensis) Fact Sheet. c2015-2018. San Diego (CA): San Diego Zoo Global; [accessed YYYY Mmm dd]. http://ielc.libguides.com/sdzg/factsheets/ratel. We are grateful for the assistance of Dr. Colleen Begg for providing expert content review of this fact sheet. Dr. Begg is among the first researchers to conducted systematic research on the ecology and behavior of the ratel. Her intensive, multi-year work focused on ratel's in South Africa's Kgalagadi Transfrontier Park in the Kalahari. She has been a long-standing proponent of carnivore conservation and currently serves as the Managing Director of Mariri Investimentos/Niassa Carnivore Project.